Relationships are the key to effective creative and we know it. After all, great work cannot exist in a vacuum, right? It requires continuous cultivation of the connections we make with those who consume what we create. This core ethic not only makes us a great shop, it makes us a great partner. Positivity, empathy, hard work and expert communication make us technically good—but the relationships we foster are what make it worth doing. Identity Design. Brand Story. Digital Strategy. Logo Design. Graphic Design. Illustration. Art Direction. Motion. Packaging. Web Design. UI/UX. Mobile Apps. Hosting/Maintenance. SEO. Email Marketing. Broadcast. Digital Media. VSP Direct—the direct-to-consumer arm of the global vision care provider VSP Global—was faced with the challenge of marketing their product in way unique-to-the-industry. The Affordable Care Act in the United States, which requires all citizens to carry minimal health insurance caused a distinctive shift in the way American consumers purchased health and vision insurance. Traditionally, VSP and many other care providers sold their products largely as a part of benefit compensation packages, which accounted for the lion share of their business. However, with the aforementioned shift in the market, it became possible for carriers to market their product directly to consumers; specifically those who may not have been receiving benefits from their employers. In order to successfully tap this new potential consumer base we developed a two-pronged approach. 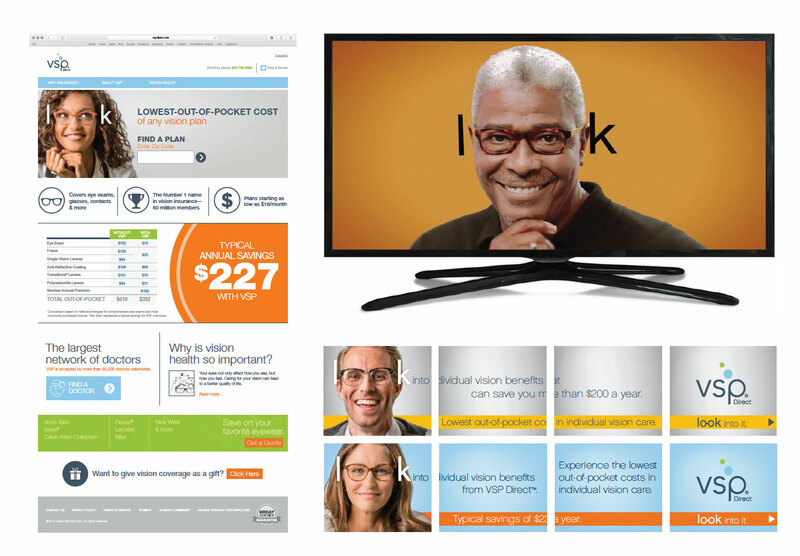 The first step was to create and launch a new website, vspdirect.com, with an online portal that allowed consumers to purchase vision care directly from VSP. Second, was to produce a consumer-focused DRTV campaign paired with targeted social media efforts in order to educate consumers about this innovative way to buy vision care. While we are currently not at liberty to share actual results of the campaign suffice it to say that VSP Direct is performing very well in terms of unaided awareness, brand recognition, consumer confidence metrics and more. Additionally they are among the top companies in the vision care industry. Ken Garff Automotive Group is one of the largest automotive sales companies in the western United States with additional dealerships in six states throughout the country. In an ever-competitive industry, Ken Garff has established itself as an organization who cares. Their many dealerships live by the simple tagline: “We hear you.” And the research backs it up, they do. However, to maintain a high standard image, Ken Garff is always pushing boundaries and willing to try new, creative solutions to market their dealerships. An example of this was the “Ezekiel Garff” campaign. 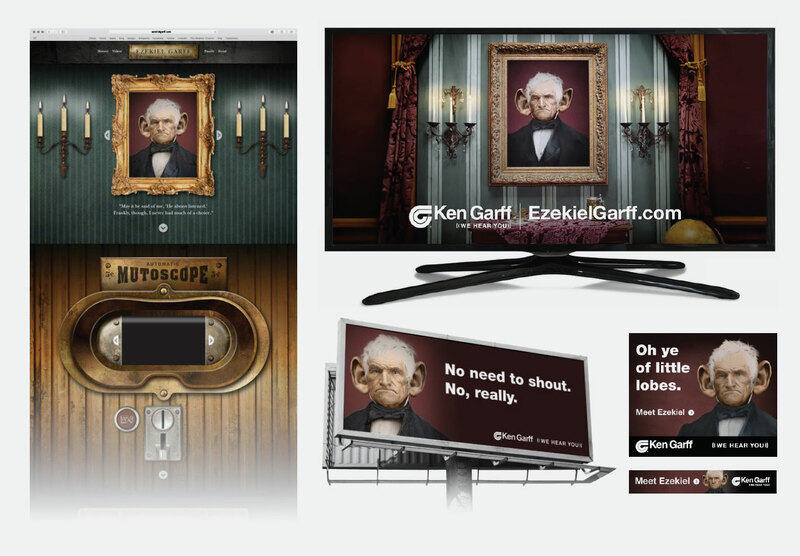 Ezekiel Garff—a fictional, pioneering relative of the company's founder with comically large ears—was a character we created to explain Ken Garff’s long-enduring heritage as the car dealers who “hear you.” Through the strategic and creative employment of the character, we were able to set social media ablaze through a number of witty television advertisements, outdoor billboards, and a live tweeting event where customers could receive fully produced video responses to their questions. As a result of this project, Ken Garff’s Unaided Awareness numbers are off the charts in many markets as a result of their disruptive, yet innovative, outdoor and television campaigns which now frequently feature comically large ears. In addition to this statistic, the Ezekiel Garff campaign not only reinforced the strength of the “We hear you” campaign but the overall Ken Garff brand as well. Founded by many prominent area investors Summit Vista is a premium resort-style retirement living facility in central Utah, United States. A facility designed to appeal to seniors looking for a luxury lifestyle well into their later years, summit vista contained several appealing features to market, such as large clubhouses with restaurants. 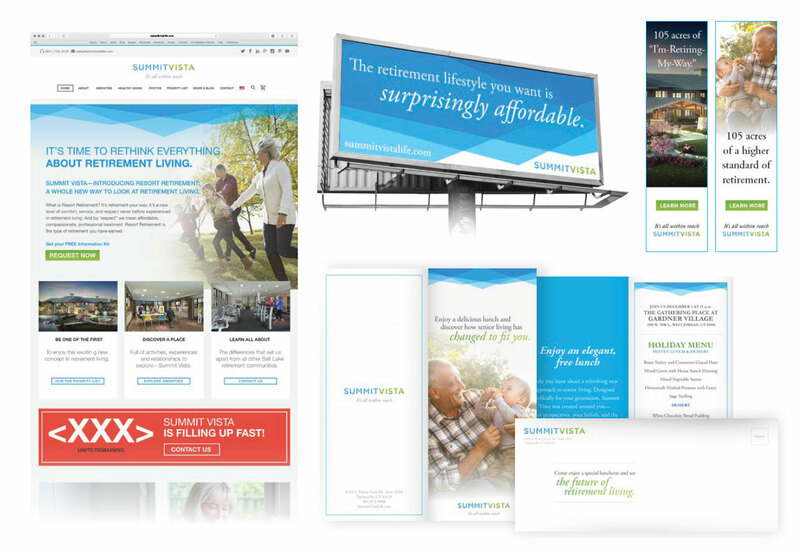 However, they needed to create a brand with a messaging package that would communicate this concept to prospective buyers. With a distinctly modern look-and-feel, the facilities conveyed a high-quality, luxury living experience designed to appeal to those with a more discerning taste. As such, designing an awareness campaign that that would further communicate that experience was no easy task. By choosing a mix of modern and traditional channels, we found a successful and effective means of reaching the audience. Specifically, through the utilization of television, direct mail, social media and other channels, we have been effective in driving a significant rush of new business leading to advance deposits being paid by future residents—a year ahead of the sites completion date. Varian Medical Systems is a manufacturer and worldwide supplier of x-ray and imaging components. Recently the conglomerate decided to spin-off their imaging products line and form a new publicly traded company called Varex Imaging. For Varex, we had to build the brand from scratch. While they had a strong historical backing in their parent company, they were virtually unknown. It was of utmost importance to not only create a strong, sustainable brand, but to communicate the high standard of quality Varian had built its success on as well. 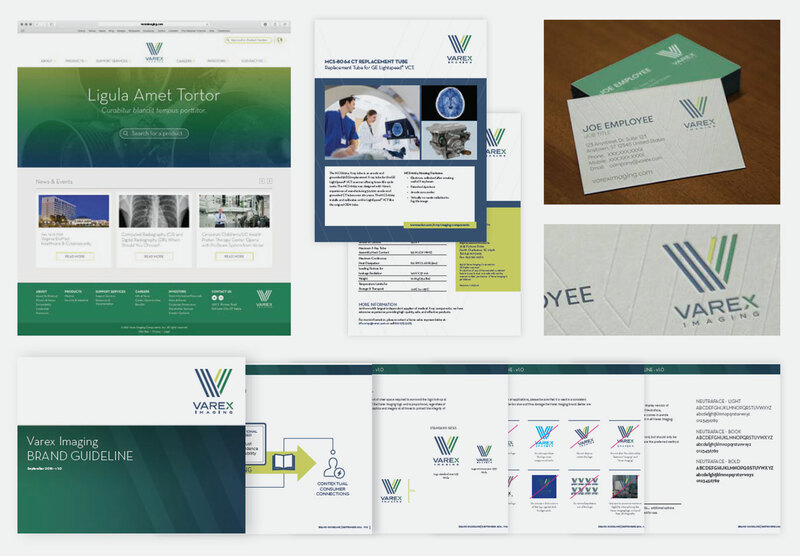 More than just a quality mark, it was important to create messaging and overarching strategy that would help Varex stand apart from its parent company in addition to other companies in the imaging space. To further support the brand, a new corporate website was designed to give Varex a complete stand-alone platform to service their clients and further separate itself from its parent. The site is presently under development and launch is anticipated near the end of the year. 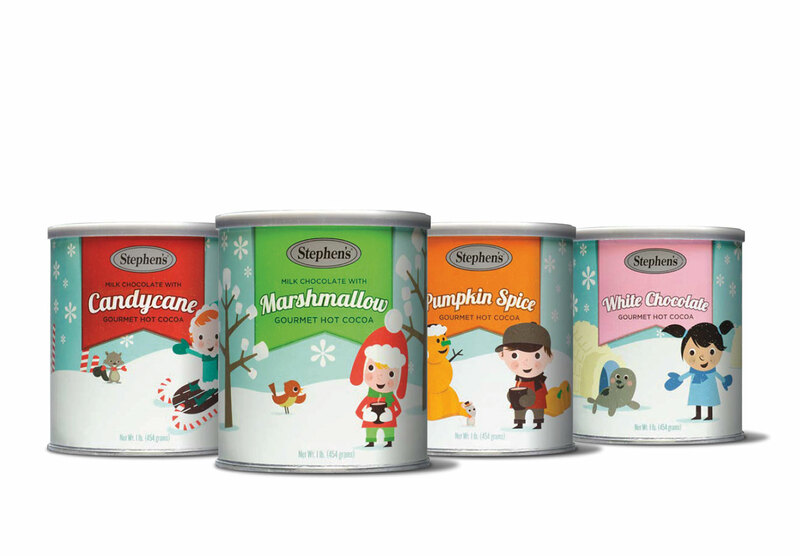 Stephen’s hot cocoa has become synonymous with the holidays, especially in the western United States where Stephen’s various products enjoy a significant market share. Faced with an opportunity to place their seasonal product line in the United States’ Costco stores, Stephen’s saw the chance to create a competitive advantage by designing a special holiday gift package to showcase some of their best-selling products. We set to work designing custom packaging for their top four seasonal products. Taking design cues from vintage holiday advertising, we created a series of simply adorable illustrations that were endearing to consumers. We could not have anticipated the reaction come launch day; Costco’s inventory of the new holiday packaging was supposed to last until Christmas, however the product was completely sold-out before October even ended. The holiday packaging was a record best-seller for both Costco and Stephen’s Gourmet and it serves as a testament to the importance of quality product paired with quality design. 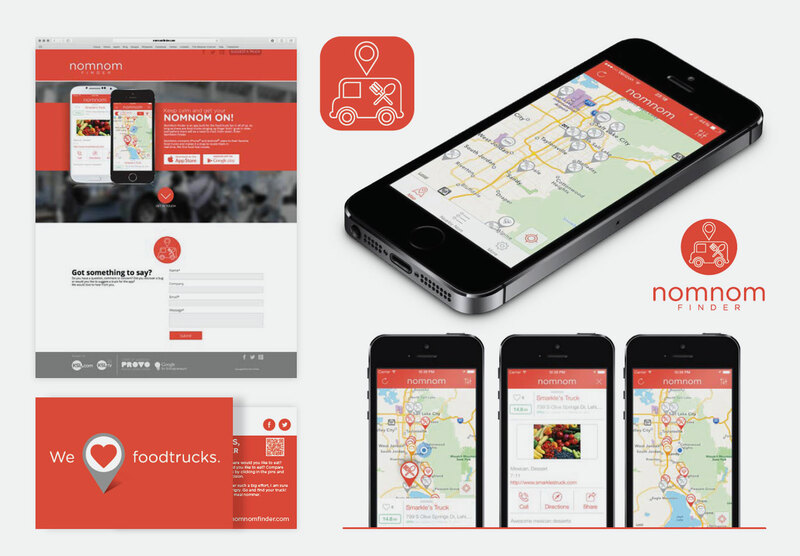 NomNom Finder, a food truck location application for iOS and Android, was born from a Startup Weekend event where our team was paired with programmers, business pros and developers to create a company from concept to launch in just 54 hours. In that extremely tight period, our team was tasked with creating the complete brand, which included everything from designing and building an informational website in addition to the complete UI for the MVP (minimum viable product). Without wasting any time, we committed to a complete brand exploration; developing logo concepts, color palettes, and typography. Once we arrived at a consensus, we set to work on creating the complete UI for iOS and Android devices, developing for both in tandem. In addition to this, we broadcasted our app on social media and reached out to food trucks in the area to populate our app. It was really a feat of coordination and cooperation. When the final buzzer sounded and laptops were put down, we found ourselves on top of the competition with not only the most complete application, but with the coveted “People’s Choice Award” for excellence. Mozy is one of the world’s leaders in online backup and security services. Recently acquired by Dell EMC, Mozy continues its long tradition of innovation to lead in an ever more crowded space. 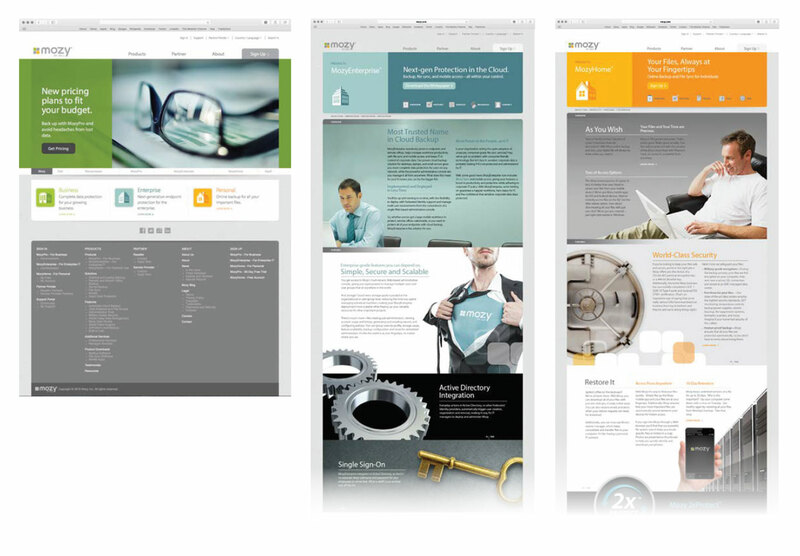 While working with a large team of multidisciplinary agencies and professionals, we were engaged in the development of the UI/UX for the complete overhaul of Mozy’s website—all 17,000 pages of it. We worked through dozens of iterations to develop a concept that provided a simple and intuitive consumer experience while being able to effectively house the sheer volumes of information contained on the site in 10 languages. The final result was an effective and attractive website which provides Mozy’s current and prospective customers concise information about their battery of products ranging from consumer cloud storage to enterprise grade online backup. When Carhartt asked us to help in their spring footwear launch we jumped at the chance. 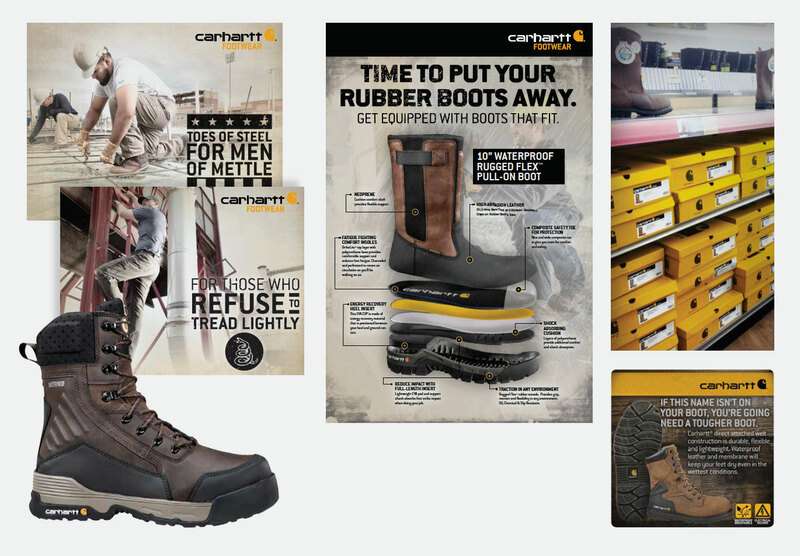 A global work-apparel giant, Carhartt is widely known for its rugged clothing—and footwear—designed for those among us doing the hardest work you can imagine. In that spirit, we set to work on creating and designing everything for the spring footwear launch, such as tags, labels, boxes, signage and more. We gave our best quality work for the highest quality work products money can buy. Faced with many challenges—namely competition—in such a cutthroat market, we tried to create assets that would honor the 100+ year history of the family-owned brand while being representative of the product and consistent with the times. Our client, Integrated Wealth Management is an independent financial advisory and wealth management firm located in California, USA. They provide thoughtful financial advice to individuals, businesses, and nonprofit organizations nationwide and presently manage more than a billion dollars in assets. Coming off the heels of a rebrand, IWM approached us for the sole purpose of reintroducing their firm to the world. This was no small undertaking; In business since 1995 they had developed a long-standing reputation as a world-class firm so it was very important not to disenfranchise or cause confusion for their clients. Additionally, the new brand needed to be front and center enough to attract new business. We set to work on a strategy to deliver just that—the best of both worlds—developing materials that were true to the new brand while giving a subtle nod to the past. 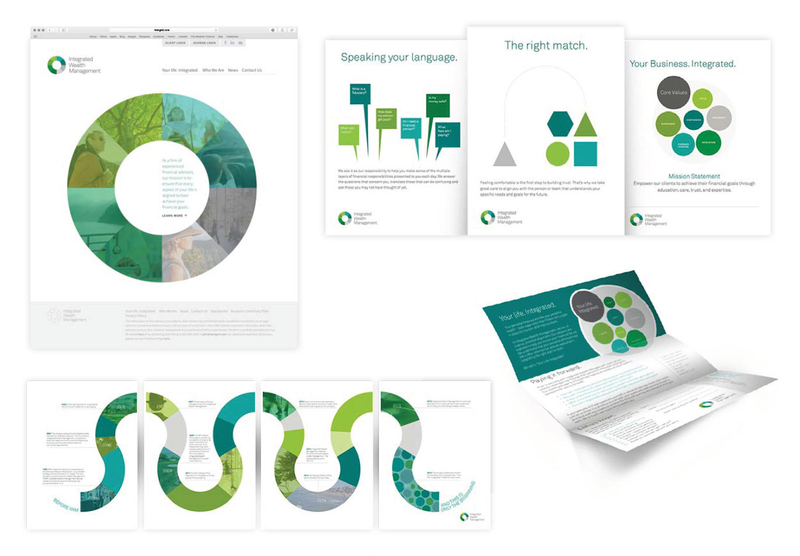 We continued working in the role of “brand shepherd” for IWM and in a relatively short span we succeeded in fully rolling out the new, revamped brand across all channels. We further reinforced the new brand by redesigning the marketing materials for IWM’s eight advisor groups, landing pages, websites and more. New brand in tow, IWM is still growing, rapidly acquiring clients and growing their portfolio whilst experiencing no client attrition during the course of the transition. We know that every great relationship starts with a great conversation — and a cup of coffee. Let’s take a look at your projects, hear about your hopes and dreams, big picture ideas, frustrations, anything. To reach out or simply request additional information, fill out the form below and we’ll be in touch lickety-split. Thanks! We got it. Someone will be in touch prontoooooo! Nope… Try again, something went wrong. © 2019 R2 Media Group, an R2 LLC company. All rights Reserved.